Spices are celebrated the world over for the depth of flavor that they bring to the dishes to which they are added. The alchemy of roasting and blending the perfect spice mix is a careful balance of sweet, sour, bitter and spicy that can elevate a dish to something truly special. But beyond their remarkable taste, many spices have huge benefits to health and nutrition that are only now beginning to be recognized in the Western world. This beautiful cook book includes a detailed study of the history, myths and traditional uses of spices. 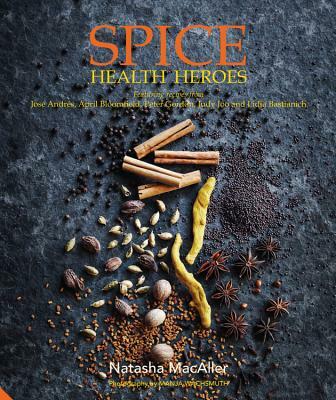 Spice Health Heroes examines the culinary, nutritional and medical applications of the everyday and more exotic spices found in your pantry. Medical and nutritional claims are backed by contributions from an impressive team of international medical professionals and institutions. With more than 80 recipes, including contributions from some 20 internationally renowned chefs from around the world, such as Yotam Ottolenghi, April Bloomfield and 2016 James Beard winners Lidia Bastianich and Ragahavan Iyer, Spice Health Heroes takes you on a journey through the spice cabinet and will inspire you to add a fragrant spice to every meal. NATASHA MACALLER spent 30 years as a professional ballerina performing with New York’s prestigious Joffrey Ballet and Boston Ballet, finishing her exhilarating career in the Broadway and Los Angeles productions of The Phantom of The Opera. Turning her artistic spirit to the kitchen, she now channels the same passion, diligence and precision that made her a successful dancer, into her love of creative cooking. She divides her time between Los Angeles, London and New Zealand, where she teaches cookery courses and writes. She’s also a highly sought-after restaurant consultant.